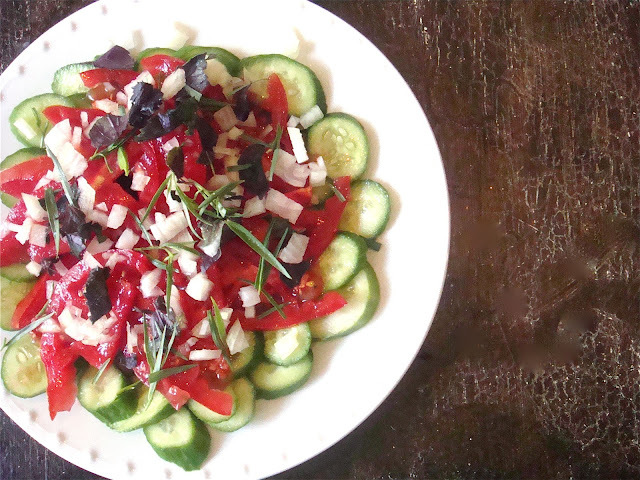 a new bohemia: georgian salad. Today begins the hottest week of summer in Tbilisi. So we're keeping the oven off and enjoying crisp fresh salads, meals from the BBQ and fresh fruits. One of my favorite salads right now is a version of the classic Georgian cucumber salad. The crunchy texture bursts in your mouth and provides a full flavor summer treat. Just make sure you search out a beautiful tomato and the firmest cucumbers you can find. Using a large platter, spread a single layer of sliced cucumbers. Top with a thinly sliced tomato. Scatter some diced white onions over the top. Next, top with some fresh tarragon leaves and some roughly shredded purple basil. Grind some fresh black pepper, sprinkle some coarse salt and add a tiny splash each of white vinegar and olive oil. That looks so refreshing. I'm going to make this tomorrow with some burgers. Oh, I MUST try this & with our garden fresh veggies... yummm!! !